This Sunday, we begin our Summer series of services, where we take a few weeks out to look at a particular theme. The aim is to make these a bit more informal: less of me preaching and more a chance for us all to explore the particular passages and what they might mean for us together. This year, we’re looking at the parables of Jesus, those wonderful but sometimes strange stories Jesus told about himself and the Kingdom he came to bring in to the world. And we’re starting with a biggie: the parable of the Good Samaritan. This is an incredibly well-known parable. Why do you think it’s so well-known and well-loved? Read it through 2 or 3 times, slowly and carefully: does anything surprise you or speak to you afresh? 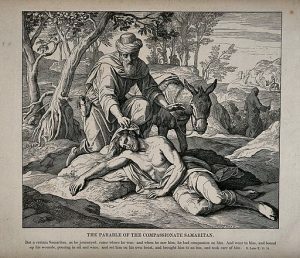 What was so different about the Samaritan’s attitudes and actions from those of the priest and the Levite? Can you think of any reasons why they reacted differently? Use your imagination: how do you think thye man who was attacked reacted when he discovered a Samaritan had helped him? You don’t have to answer all of these, but if they do provoke any thoughts or questions or prayers that you want to share, then please write them in the comments below. And we’ll look forward to seeing you on Sunday at 10:45am to explore this story together!